Dar Lighting Duchess 6 light semi flush ceiling fitting features a circular design ceiling plate with a laser cut, oval lattice frame, all in polished chrome finish and a display of strings of luxe crystal droplets. The product code for this Dar ceiling pendant is DUC0650 . 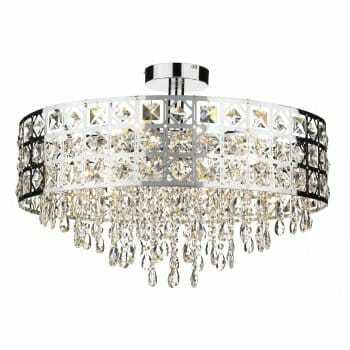 This stunning semi flush fititng will be an eye catching statement piece of lighting, great for rooms with low ceilings and provides a sparkling display of light when both switched on and off. The Duchess is an all new eye catching collection of fittings which includes a variety of ceiling fittings and a wall fitting.